From Thursday, April 9th to Monday, April 13th 2015 the IwB students, faculty and staff travelled to Chicago for the Resilient Routes Chicago Charrette. 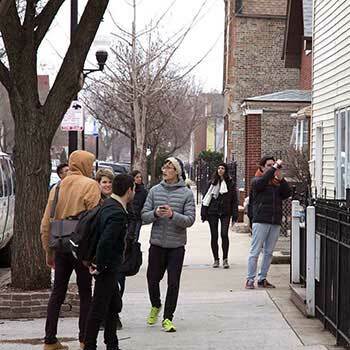 The event was conducted in collaboration with the Institute’s 2014-2015 project partners for the Connecting Divided Places project, namely the City of Chicago, Cannon Design and the Chicago Architecture Foundation (CAF). The Resilient Routes Charrette looked at how public routes and the common spaces in the communities of Pilsen and Little Village could be used to address the challenges facing these communities. Five case study sites were chosen: 18th Street and the Rail Line in Pilsen and 26th Street, the Paseo and Pulaski Rd. in Little Village. The concept of city resiliency was utilized as an overarching theme to promote longevity and strength in urban communities to survive, adapt and grow regardless of stress factors faced by those community (Rockefeller Foundation definition, 100 Resilient Cities). Based on the assigned case study sites, charrette teams were asked to increase resiliency in Pilsen and Little Village by activating common spaces through five lenses: stormwater management, livable density, growth, culture and heritage, economic development and leisure and wellness. How can we use the common spaces that make up public routes to improve neighbourhood resiliency? Pilsen and Little Village are two neighbourhoods in south Chicago’s downtown core that have a rich history, tight knit communities and evolving cultural fabric. Pilsen and Little Village have been entry points for new immigrants to the United States and the Chicago area. The two largest ethnic groups in these communities have been Bohemians immigrating from what is now the Czech Republic in the 1800s, and Mexican immigrants who came to Chicago from the mid to late 20th century. Today the Latino population is by far the majority; over 80% of residents in Pilsen and Little Village identify themselves as Latino. Signs of this these immigration waves are present throughout the communities. Pilsen was named by the Bohemian immigrants, taking its moniker from Plzeň, the fourth largest city in the Czech Republic. 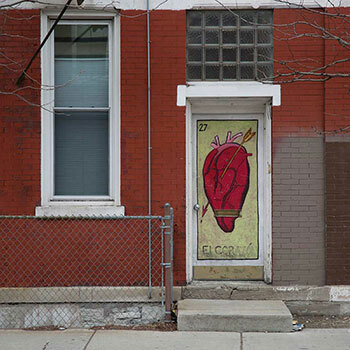 Painted murals have become a Chicago feature, but they were an art form brought to the area by the Mexican immigrants. Interestingly, some of the murals began as a collaborative effort between the Czechs and the Mexicans, depicting immigration challenges and cultural elements of both groups. Today these neighbourhoods once again are undergoing changes. Major new developments in Pilsen, such as University Commons on the site of the old produce terminal are driving gentrification that is attracting new residents to the area and creating friction between new and old communities. Little Village has the youngest population of all Chicago neighbourhoods and is experiencing increases in residential density. This is not due to the addition of higher density housing, but because larger families are living in the same homes. Thus, both neighbourhoods are significantly above Chicago’s average population density, meaning that private spaces are reaching capacity for meeting the needs of residents. In addition, these areas have been heavily occupied by industrial uses, resulting in very little land being available for public and green spaces. Little Village has less green space per capita than any neighbourhood in Chicago and Pilsen is 76% below the Chicago average. These density and lack of public space issues are combined with more widespread city challenges such as stormwater management, prompting debates around how to increase the resiliency of both neighbourhoods. Reimagining the public routes through different elements of resiliency can expand public infrastructure for the communities and address resiliency as a whole. Given this context, the Resilient Routes Charrette looked at ways to allow the neighbourhoods of Pilsen and Little Village to effectively respond to the challenges affecting them today and in the future. The summaries of the charrette teams’ design proposals are available below. The challenge: 1) To develop a route that promotes the contemporary and historical heritage of the Pilsen neighbourhood and considers the ‘qualities of resilient systems’ as outlined int he brief; 2) To create new programs, services and activities that leverage culture and heritage to help foster new relationships that overcome divisions in the community. 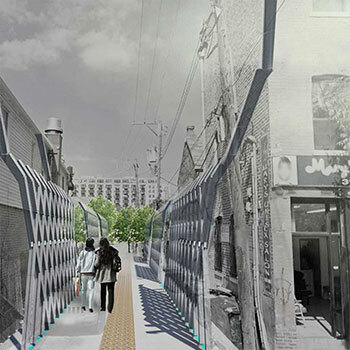 Team 1 proposed 18th Street Canvas District, a route through Pilsen that explores the act of weaving. The proposal introduces new elements such as pavement wayfinding creative projects, neighbourhood art projections and a time-capsule panel to create public awareness about new ways to experience the neighbourhood. For more info about this project, download the presentation. The challenge: 1) To develop a route that fosters local economic development and better connects the Pilsen neighbourhood to the industrial area and considers the ‘qualities of resilient systems’ as outlined in the brief. Team 2 looked at making the industrial area in the community an integral part of the common space by changing the boundary condition of the residential and industrial areas from an impermeable fence to a functional border in order to make it a familiar place. The Challenge: 1) To develop a new a route that focuses on leisure and wellness in the Little Village neighbourhood and considers the ‘qualities of resilient systems’ as outlined in the brief; 2) To design a low cost intervention that attracts residents to experience the Paseo. Team 3 proposed “The Loop,” a design proposal to develop the abandoned rail line into an immersive path of leisure and wellness through green connectivity and social programming. The challenge: 1) To develop a route that provides liveable density in Little Village and considers the ‘qualities of resilient systems’ as outlined in the brief; 2) To create alternative spaces for services and activities that can not be supported in overcrowded private spaces. Team 4 proposed “26” (twenty-six or veintiséis), a concept for creating a resilient, public green space on 26th street. The proposal looks at changes in La Villita (Little Village) that have small to large-scale, economic and social impact, including changes to the neighbourhood’s built environment. The challenge: 1) To develop a route that integrates new developments and residents with the existing community in the Little Village neighbourhood and considers the ‘qualities of resilient systems’ as outlined int he brief; 2) To create new programs, services and activities focused on connecting the current residents of the Little Village community with new residents and developments. The team proposed “Little Greenergy,” a proposal to create a vibrant connection and waterfront area that merges innovative green manufacturing, community spaces and a clean energy hub.